A proposal to tax sugar sweetened beverages like tobacco in India has been welcomed by public health advocates. The proposal to increase sin taxes on aerated drinks is part of the recommendations made by India’s Chief Economic Advisor Arvind Subramanian on the upcoming Goods and Services Tax (GST) bill in the parliament of India. Taxation to reduce consumption of tobacco has been successful when used alongside measures such as public education and restrictions on advertising and marketing to children, and stronger labeling laws. The consumption of added sugars in India is still relatively low compared to countries such as the US, UK and Mexico. In the US, where 69% of adults are overweight or obese, 36% of the added sugars consumed come from liquid drinks such as carbonated beverages, juices and energy drinks. As a result, the US is witnessing a strong growing movement to regulate sugar sweetened beverages. “The proposal to tax sugar sweetened beverages similar to tobacco is a positive and proactive step. Increased sugar intake has been proven to be a bane for public health in countries where it is widely consumed. In addition, the government of India must also regulate marketing and promotion of such products especially targeting children,” said Dr Arun Gupta, a senior pediatrician and regional coordinator of International Baby Food Action Network (IBFAN) Asia. Just one can of a 12 ounce (355 ml) Coca-Cola contains 39 grams of sugar, and the World Health Organization (WHO) hasrecommended consuming added sugars no more than 10% of the daily calorie intake, or roughly 12 teaspoons (50 grams) of added sugar per day. 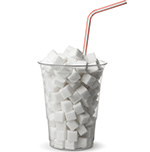 For optimal health benefits, the WHO recommends 6 teaspoons of added sugar (25 grams) per day. “As the WHO, the UK Ministry of Health, Public Health Foundation of India and the US dietary guidelines have all noted, added sugar in beverages and food is a major cause of increased weight gain, waist circumference and risk of diabetes,” noted distinguished Professor of Nutrition and a PhD economist, Barry Popkin of the University of North Carolina at Chapel Hill. “In Mexico, in an article forthcoming in the British Medical Journal, we have shown that tax on sugary beverages reduces added sugar intake significantly commensurate with the tax level. An unpublished study shows that the junk food tax on foods high in sugar is equally effective in Mexico", he said. "India, with the world’s highest number of diabetics, needs to find ways to cut sugar intake as it is a major cause of diabetes in India. India’s sugar consumption is rapidly increasing and this tax is critical to slow down this very rapid growth of diabetes”, he added. Leading British cardiologist and founding member of campaign group Action on Sugar Dr Aseem Malhotra said, “A diet high in sugar and refined carbohydrates is driving a massive increase in the prevalence of type 2 diabetes amongst the Indian population. Two out of three persons with type 2 diabetes die from cardiovascular disease, and more than half of these deaths occur prematurely." “The proposed tax would undoubtedly impact population health. Many Indians have disproportionately high rates of type 2 diabetes and non-alcoholic fatty liver disease. There is also some evidence that many Indians have genetic susceptibilities to develop fatty liver on diets excess in added sugars. This is a landmark proposal,” said Dr Laura Schmidt, Professor of Health Policy in the School of Medicine at the University of California at San Francisco. The proposal to increase sin taxes on sugar sweetened beverages are not new to India, and are part of a rapidly growing global movement to curb the growing consumption of added, and often hidden, sugars in our food. Last year, in June 2014, the Indian government increased the excise tax on aerated beverages containing added sugars by 5%, citing health considerations as the reason. Earlier this year, the Delhi High court ruled that junk food – high in fat, sugar and salt – must be restricted in schools and a 50 meter radius. Companies like Coca-Cola and PepsiCo try to mask the negative health impacts of their products through massive advertising and marketing efforts which misleads the public. Taxing these products is the right way forward, and restrictions should also be placed on celebrity endorsements of these unhealthy products, including Bollywood.